CAN PEOPLE GO TO MARS? A new study shows that an 18-month mission to Mars could expose astronauts to more space radiation than NASA shielding technology can handle. Long-term missions to the Moon could be problematic, too. Get the full story from Science@NASA. "I saw some lightning out the window of my home in Paris," says Atek. "So I set up a tripod and pointed my camera (a Nikon D80) at the Eiffel Tower. I never expected to get such an amazing picture." But did the Tower really make its own lightning? The surprising answer is "yes." 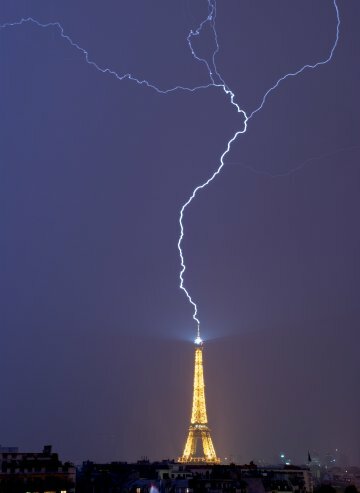 "The upward branching in this photo shows that the Eiffel Tower actually initiated the discharge," says lightning researcher Richard Blakeslee of the NASA Marshall Space Flight Center. "In other words, instead of starting in the cloud and coming to ground, this flash started when the tower 'launched' a leader that propagated upward toward the cloud (which still served as the source of the electric field needed to get the process going). As the leader ascended, it branched out. Eventually one of the branches reached a region of sufficient charge to 'short out the cloud' and produce the return stroke pictured above." According to Martin Uman's classic text The Lightning Discharge, upward-initiated discharges are "relatively rare," accounting for less than 1% of all lightning, "and generally occur from mountain tops and tall man-made structures." K. Berger, who studied lightning from a mountaintop location 30+ years ago, was one of the first to describe the phenomenon. Reference: Blizstrom-parameter van aufwarsblizen, Bull. Schweiz. Elektrotech., 69, 353-360, 1978. 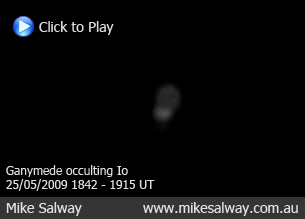 On May 28, 2009 there were 1060 potentially hazardous asteroids.